Northwestern parking lot east of Kemper Hall. The Plan Commission recommended that the city approve changes to a university parking ordinance. 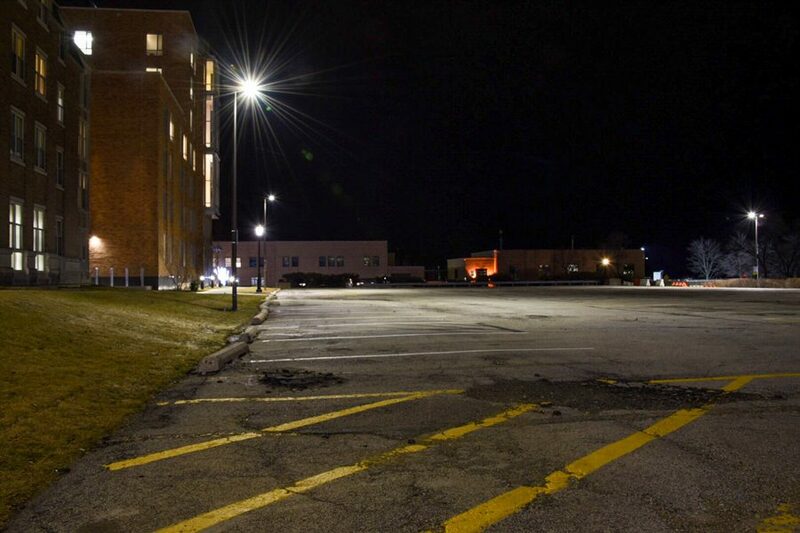 Members of the Plan Commission voted at a meeting Wednesday night to recommend a decrease in the number parking spaces Northwestern is required to have, opening the way for the city to use the lot east of Kemper Hall. Based on the amount of parking spaces available on the Evanston campus and the amount of spaces actually used by students, staff, faculty and visitors, the commission unanimously voted to recommend the Planning and Development committee decrease the number of parking spaces mandated by the city. Under the proposed changes, NU will give the city permission to use the parking lot east of Kemper Hall. A current ordinance states that NU should have one parking space per five residents of dormitories, fraternities and sororities living on-campus and one per three employees. The revised amendment would change this number to one space for every 10 residents but would leave the number for employees the same. Currently the university has 4,111 parking spaces on its Evanston campus. Under current zoning ordinance, the city requires the university to have 4,096 spaces, but several commission members raised concern with these numbers, saying it double-counts students who live on campus. The amendment comes as NU and the city are working on a plan to renovate the city’s water reservoir at the intersection of Lincoln Street and Campus Drive. The University and the city are co-applicants for this amendment. Assistant city manager Erika Storlie said the city needs this space since, because of the renovations at the Evanston water reservoir across the street, they will lose about 140 parking spaces at the building. “Without our need for this requirement to be reduced, we would not be having this conversation,” she said. The city’s neighborhood and land use planner, Meagan Jones, said these ordinances were created when Evanston was still home to other colleges and universities, including Kendall College and National Louis University. She said since Northwestern is the only university in Evanston today, the ordinance is out of date. The commission also pointed to a study the University conducted in 2015 that showed parking utilization rates at peak hours still produced a surplus of 1,161 spaces. Jones also noted that there are 492 NU students — who are either seniors or graduate students — living in residential dorms, sororities and fraternities that are eligible for a parking passes, but only 30 students actually have them. “This (new) requirement would still provide more parking than the 1-to-16 ratio of students who have parking permits to those who are eligible to obtain parking permits,” Jones said. The proposed amendment would reduce the number of required spaces to 3,493. The commission said the amendments would also aid in future construction projects at NU. City staff wrote in a memo that the proposal was working towards a goal of balancing institutional needs and the quality of surrounding neighborhoods. The amendment will now move to the Planning and Development Committee for discussion and approval.